There is a song by Bette Midler from a few years ago entitled "From A Distance". The lyrics paint a picture similar to this Sunday's first reading (Book of the Prophet Amos 8:4-7) - a world of greed and anger and the mistreatment of the poor, and how God would like to see us treat one another. Our reading ends, "Never will I forget a thing they have done" - and God is watching us. "Hear this, you who trample upon the needy and destroy the poor of the land! 'When will the new moon be over,' you ask, 'that we may sell our grain, and the sabbath, that we may display the wheat? We will diminish the ephah, add to the shekel, and fix our scales for cheating! We will buy the lowly for silver, and the poor for a pair of sandals; even the refuse of the wheat we will sell!' The LORD has sworn by the pride of Jacob: Never will I forget a thing they have done!" 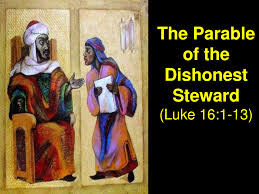 In our Gospel reading today (Luke 16:1-13), Jesus used the example of a dishonest steward who was prudent with protecting his self-interest. Jesus seemed to be urging his followers to work as hard for the Kingdom of God as those with "dishonest wealth" worked for their own worldly goods. "He called in his master's debtors one by one. To the first he said, 'How much do you owe my master?' He replied, 'One hundred measures of olive oil.' He said to him, 'Here is your promissory note. Sit down and quickly write one for fifty.' Then to another the steward said, 'And you, how much do you owe?' He replied, 'One hundred kors of wheat.' The steward said to him, 'Here is your promissory note; write one for eighty.' And the master commended that dishonest steward for acting prudently. "For the children of this world are more prudent in dealing with their own generation than are the children of light. I tell you, make friends for yourselves with dishonest wealth, so that when it fails, you will be welcomed into eternal dwellings. The person who is trustworthy in very small matters is also trustworthy in great ones; and the person who is dishonest in very small matters is also dishonest in great ones. If, therefore, you are not trustworthy with dishonest wealth, who will trust you with true wealth? If you are not trustworthy with what belongs to another, who will give you what is yours? No servant can serve two masters. He will either hate one and love the other, or be devoted to one and despise the other. You cannot serve both God and mammon.'" In our Epistle reading (The First Letter to Timothy 2:18), St. Paul gives advice that is relevant even to this day - Pray for our leaders and "all in authority", that they may act wisely and compassionately..
"Beloved: First of all, I ask that supplications, prayers, petitions, and thanksgivings be offered for everyone, for kings and for all in authority, that we may lead a quiet and tranquil life in all devotion and dignity. This is good and pleasing to God our savior, who wills everyone to be saved and to come to knowledge of the truth. For there is one God. There is also one mediator between God and men, the man Christ Jesus, who gave himself as ransom for all. This was the testimony at the proper time. For this I was appointed preacher and apostle - I am speaking the truth, I am not lying -, teacher of the Gentiles in faith and truth. It is my wish, then, that in every place the men should pray, lifting up holy hands, without anger or argument."